Week 41- Vineman 70.3 Race Report and Congrats to Rich Fox and Hez for completing their first Ironman in full on rain in Lake Placid! I was able to get Hez's finish on video by sitting patiently in front of my laptop with my digital camera but I was still on the run course at Vineman when Rich finished in an amazing time of 10 hours and 21 minutes! Spotted Chris Lieto (6th overall at IM Kona and holds many bike course records across IM events) by his Biodiesel and Solar Green Van and a took picture with him! The girls (Heidi, Mary, Mel and myself) left Mary's place in Novato at 4:20am ish and arrived at Johnson's Beach (swim start and T1) at 5:30am...got a sweet parking spot and was able to set up and get body marked before the bulk of the crowd arrived. Thank goodness because the chaos was a bit overwhelming watching loads and loads of triathletes with their shining bikes trying to get through the bike check. Speaking of bike check, the sticker that we were suppose to affix on the left of the top tube flew off during the morning drive so I took the one off my helmet and slapped it on the bike. Good thing because before letting you into T1, they checked for sticker on left top tube of the bike and bike ends..phew! Good save! I didn't have expectations going into this race because I knew I was suppose to make it a long workout day and I am still feeling the fatigue from weeks ago granted I am on my way to recovery but I had wanted to do a little better than I did! Read on..
Swim- I love the Vineman swim because you can't get lost and it's in shallow water in which you can actually walk the swim if you wanted to! The swim was longer than I had remember it to be. 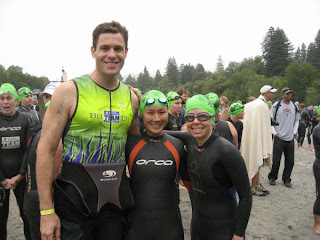 I finished the swim in 49+ minutes..4 minutes slower than my pace when I did the swim in a relay last August. If I talk to my coaches...they will tell me that I shouldn't expect to match my speed from a year ago because I am in a phase of fatigue. Below- Brian, myself and Renee. Congrats to Brian for earning a slot to the Ironman 70.3 Championships!! Bike- 56 miles..3 hours and 35 minutes. I really just tried to enjoy the bike ride as much as I could even though I had to visit every port-o-potty I saw! I think it was at the second potty when I pulled over (seemed like everyone wanted to use the potty at this point), this little girl of a volunteer..probably 9 or 10 in an oversize volunteer t-shirt maybe a feet or so taller than my bike offered to hold my bike up..so sweet! This guy who pulled ahead of me told me to go first..I asked him if he was sure and he said go! go! go! So go I went! Grabbed my bike from little girl..thanked her! Mile 56..I was so relieved to get off the saddle and get on with the run. Run- 13.1 miles of rolling hills 2 hours and 54 minutes was a bit uneventful except that I lightened up everytime I saw a teammate of mine! I walked a bit towards the end of the run..the last 5 or so miles and man.. the company you are surrounded with is quite interesting. This is the pack where everyone is just holding on to finish this thing out! People are talking to themselves out load..yelling at themselves.. giving themselves pep talks..if only I had a video camera! I was repeating to myself "left ..left..left right left.." to try to keep a tempo with my run or walk. Every race I've done this season was for practice..as a dress rehearsal for Ironman Louisville..figure out what my body needs..doesn't need..likes..doesn't like..get myself through things mentally.. and just go through the motions of a race. After the first mile at Vineman, I really wanted to turn around because my quads were aching but I couldn't turn around. Mentally, I needed to finish because I wanted that medal! Below- medal earned!